For our IoT Assignment 2, my team and I had decided to come up with a security solution for our smart home by implementing different security features such as a Smart Door with two-factor authentication, smart car-plate authentication and live CCTV footage. At the entrance of the smart garage, the camera will take a snapshot of the car-plate. Next, the garage door will only be opened if the car-plate is authorised. Once the owner has parked his car, he can proceed to enter his smart home. There is also an ongoing live stream that shows real time footage of what happens just outside the garage, to deter any possible intruders. To enter his smart home, the owner has to key in a 4-pin password into the keypad. The owner has only a limited number of times that he can try or else he will be locked out of the door. When the user hits the number of thresholds, he will receive an email with the new pin. He can then key in the new pin to pass the first authentication process. The owner will also be alerted with a Telegram message informing him that someone had exceeded the number of thresholds. Next, the facial recognition will begin and the camera will start scanning for faces in the room. The user has only 10 seconds to complete this process. If the facial recognition recognises the owner, it will allow the user to access the smart home. The LCD screen will then welcome and address the owner by his name. Once the user enters the room, the room will start recording Temperature and these values are recorded to the Amazon Web Service (AWS) database. Later on, the recorded values can be seen via the web-page in the form of a line graph. This is the tutorial document for all the steps that were taken for the project to get up and running. 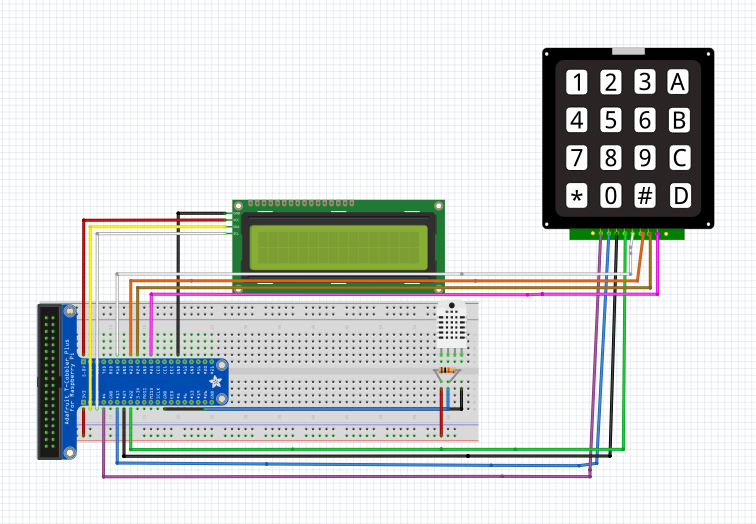 This is the Fritzing Diagram for the Smart Door. 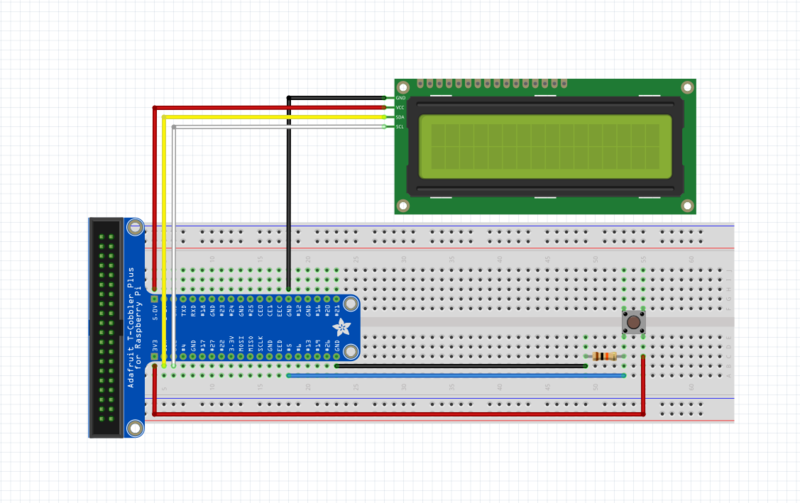 This is the Fritzing Diagram for the Smart Garage. This is the python file that takes a photo of the person's face and uploads it to the DynamoDB database. This is the code for the keypad. This code will run the aws_faceRecognition.py file and if the face is not recorded in the database, a photo will be taken of the person's face and be sent to the person via Telegram. They keypad will also take in 4-pin inputs, and if the threshold( number of times allowed for wrong input) has been hit, a new pin will be generated and sent to the person's email. This is also run after the 2 factor authentication has been passed. It will record temperature and upload the data into the DynamoDB database. This is the code that utilises AWS Rekognition to detect and authorise car-plates. ; detection_iteration_increase is the percentage that the LBP frame increases each iteration. ; It must be greater than 1.0. A value of 1.01 means increase by 1%, 1.10 increases it by 10% each time. ; are clustered around the same area). For example, 2 = very lenient, 9 = very strict. ; lbpgpu    - LBP-based detector that uses Nvidia GPU to increase recognition speed. ; morphcpu  - Experimental detector that detects white rectangles in an image. Does not require training. ; If set to true, all results must match a postprocess text pattern if a pattern is available. ; If not, the result is disqualified. ; Bypasses plate detection. If this is set to 1, the library assumes that each region provided is a likely plate area. ; will be analyzed. The mask image must match the resolution of your image to be analyzed. The mask is black and white. ; would classify  ALL images as high-contrast, setting it to 1.0 would classify no images as high-contrast. ; Minimum OCR confidence percent to consider. """Video streaming route. Put this in the src attribute of an img tag.""" This is the code for the face recognition through AWS Rekognition. print "[-] No faces detected..."